Prositions makes it easy to build development programs that are adaptive and flexible – from start to finish. Build up the skills of your leaders, coach those with performance problems, and help get the ones who didn’t fit back to work fast. Training and development designed for every level of leadership. Certified professional coaching packages for any performance issue. Help get your employees back to work fast after a layoff or reduction in force. Learn 5 ways to make learning stick. Learn how a manager can apply adaptive leadership. 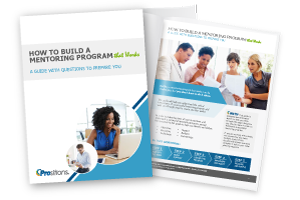 This guide will walk you through the steps to create a mentoring program that works! 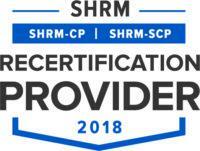 Prositions, Inc. is recognized by SHRM to offer Professional Development Credits (PDCs) for the SHRM-CPSM or SHRM-SCPSM. Prositions, Inc. is a recognized provider of recertification credits. 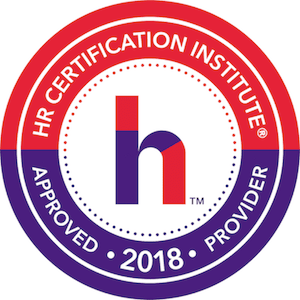 HR Certification Institute® approves credit towards aPHR™, PHR®, PHRca®, SPHR®, GPHR®, PHRi™ and SPHRi™ recertification. Thank you for helping us with our talent management strategy this year. Because our team is spread out across the globe, your solution was perfect; it has been a significant factor in our growth and success. You exceeded my expectations! I’m happy to report we’ll be extending and expanding our contract with you guys in the future. We can already see the huge potential for developing our leadership team by improving overall employee collaboration and engagement. 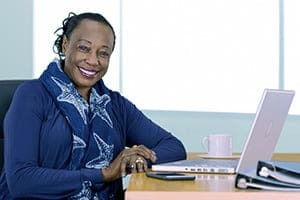 We also like the integrated content for mentoring skills because it allows our internal coaches and supervisors to access knowledge and information anytime and anywhere. Thank you and your company for helping our employees. Everyone I’ve talked with is very encouraged by your efforts and confident that with the help of Prositions new doors will open for them in the future. I am very happy that we selected Prositions as our partner! Keep up your great work!! Very much appreciated. If you’re ready to change your organization, sign up below!